Since the installation, heating and cooling costs have dropped by an estimated 22% and employees have reported greater comfort. The Amec Building, a thirteen-story office complex in Vancouver, British Columbia, features floor-to-ceiling windows on its entire southern face. And while those windows are an aesthetic asset, they were a liability to tenant comfort. According to the building's property manager, the office complex was originally constructed with windows that offered only minimal solar protection. So once the sun's rays reached the windows in the morning, the temperature would quickly rise. In addition, there are fifteen separate zones on a floor, each governed by a thermostat that automatically goes up or down depending on the conditions. In response to the heat of the sun, the thermostats closest to the windows would activate the air-conditioning - not enough to cool the overheated areas - but more than enough to make room temperatures in areas farther away from the windows uncomfortably cold. Sundog Energy Management Inc. of Vancouver, a 3M-authorized Dealer Applicator, was called to resolve the problem. The company's owner, William Ross, says, "You could stand by the windows and just feel the heat. I knew we could greatly improve the situation if we could reduce the effects of the sun on the envelope of the building." Ross recommended LE35AMARL Scotchtint Plus All Season window film to reduce the solar warming in the building and enhance the comfort level of tenants. This low-emissivity film reduces solar heat transmission by as much as 70% depending on the type of window. The film also reduces heat loss in the cooler months by as much as 30%. "I'm not in business just to sell products," says Ross. "I'm in business to offer clients the right solution for their specific problems." Since the installation in 1995, the tenants, especially those closest to the windows, report greater comfort. In addition, the building's property manager says she estimates that heating and cooling costs for the office complex have dropped by 22% since the installation of 3M Scotchtint window film. And while cosmetics were not the primary concern, she agrees that the film has enhanced the appearance of the building too. 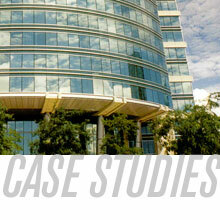 A year after Sundog installed 3M Scotchtint window film on the windows of the building's thirteen floors, Sundog was invited back to install Scotchtint on the foyer windows. According to Ross, the installation was a relatively painless procedure. But what is more important is that since the installation, the building manager has heard very few complaints about the offices being too warm.